Craft circular soap faster with this column soap mold. Once soap has hardened, remove from the mold and slice into bars. 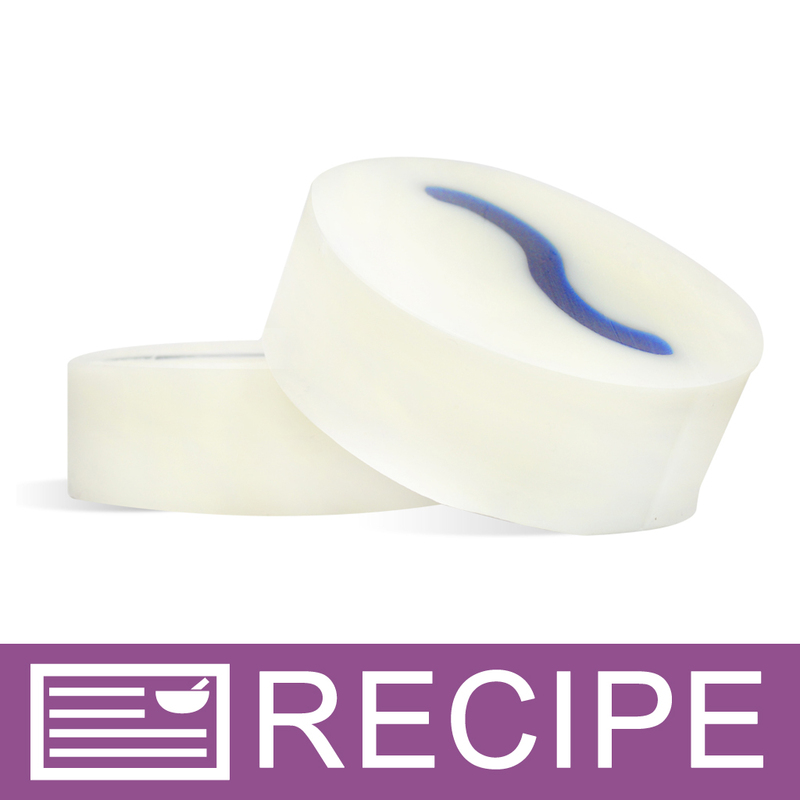 You can also embed smaller soap columns into this mold; fancy designs made simple! Melt & Pour Soap: Close the mold by firmly pressing the edges together. For added safety, clamp the edges. Support the mold with two flat objects such as two mitre boxes on their sides. Slowly pour melted soap no hotter than 130ºF into mold. Allow soap to harden then open mold and remove soap. Trim edges with a potato peeler or spatula then slice into bars. Cold Process Soap: Close the mold by firmly pressing the edges together, and clamp the sides. Support the mold with two flat objects such as two mitre boxes on their sides. Slowly pour traced soap into mold. After at least 24 hours, remove soap from mold with gloved hands. If desired, trim edges with a potato peeler or spatula. Slice into bars and allow soap to cure for 4-8 weeks. Note that some cp soap recipes may require a week to harden enough to remove from the mold. If this is the case with your recipe, we recommend adding sodium lactate to your recipe to assist with creating a harder bar faster. Hot Process Soap: Close the mold by firmly pressing the edges together, and clamp the sides. Scoop hot process soap into mold. Gently tap the mold onto the counter to remove air pockets. Allow soap to cool and harden. (This can take up to 48 hours.) Open mold and remove soap loaf. If desired, trim edges with a potato peeler or spatula. Slice into bars. COMMENTS: I watched the video, reinforced the sides and clamped it shut but oh those seams, I really don't like having to shave the soap in hopes of a perfect bar and it was more work than using the pvc pipe mold. I've since decided to use this mold for my lined round bars. Possibly an item that could be re-tooled or offer lining sheets to go with it. COMMENTS: I use this mold for my shave soap. it works nicely and makes a perfectly round bar of soap. easy to use. just don't tamp down to hard or too many times or soap seeps out side seal. I use thick clips to hold sides together firmly - just in case. "Works great! Bye Pringle can"
COMMENTS: Absolutely love this mold. My round soaps look so much better! COMMENTS: This is a decent, sturdy mold but I find that the seems are not as clean as they could be. "Round regular column cylinder mold"
COMMENTS: This is real hard for me to get the soap out of the mold even tho I am following the directions. I even watched a you tube video and still needed help. COMMENTS: I loved this, it was east to fill and easy to get my soap out and clean! The only thing about it that was "wrong" was that the sides had a line where the mold closed, but it wiped away easy enough!! COMMENTS: We have been using Pringles cans to make our shave bar soaps but then I found this and I love it. It doesn't leak or anything. It is perfect. Now I don't have to use the Pringles cans. COMMENTS: I really like this mold, one I don't have to fight to push my soap out...very easy release. It's sturdy and secure I've made many batches of soap with no leaking even pouring a thin trace and I've using this for a year! I just wish it was a little longer. 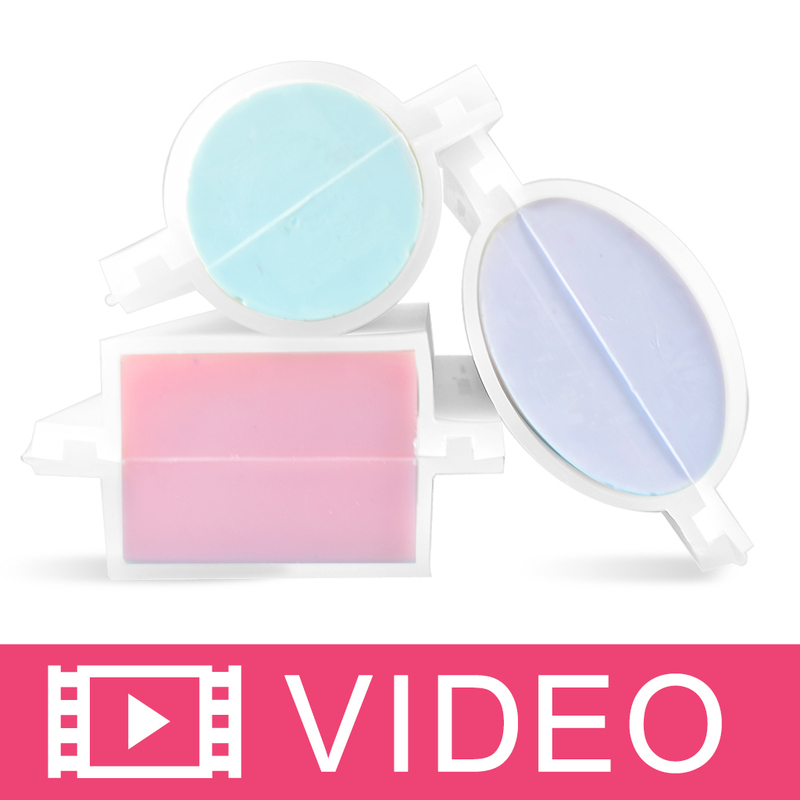 You can't beat the price for an easy to use mold that gives you beautifully round soap! COMMENTS: Love this mold! It's perfect for shaving and facial bars, and so much easier to use and unmold than the pvc pipe that I was using. In fact, planning on ordering a second one. "Right size for Shaving Soaps"
COMMENTS: I use this mold to make my round shaving disks. It's just the perfect size. I love that I don't have to line this mold before pouring in the cp soap batter. The soap pops right out. COMMENTS: This definitely works. I haven't had any issues with the seal. I did a water test when I first got it and had a tiny bit of leakage after 30 min, but haven't had any soap leakage, even with thin trace. Releases cleanly, though I use a bit of mineral oil to make sure the corners don't stick. The diameter of the mold is lovely--completely matches the pringles cans I was using. My issue is that when it fills with soap, it no longer has a perfectly round shape. Also, the inside where the two halves meet up are not flush, so even if you trim a bit of seam soap off you still have a line where it's uneven. I would also prefer the mold to be just a bit taller. "I love this pillar molds"
COMMENTS: I love this pillar molds all of them make a great inbed! COMMENTS: It's extremely sturdy and the sides seem to stay together perfectly on their own to form a water tight seal. I am using binder clips on the sides just for my own peace of mind... the way these fit together, I highly doubt they will leak. I am using for CP soap - wrap with a towel to gel and you're set! "Are these TWO 3/4 "molds for $22.26 or ONE 2 and 3/4 " mold for $22.26?" "It is difficult to see from the photo(s) provided whether or not this silicone column mold comes with silicone end caps. What holds these "halves" together while pouring soap into them? Do you have any plans to provide a full 3" diameter silicone column mold and perhaps a little longer length?" It doesn't come with a end caps but one end is closed. It does stay together pretty well because of the tongue and grove. If you are worried about it not staying together you can always use binder clips. "Is good to use w CP soap and if so how easy is it to remove? How many pounds or ozs of soap is this good for?" Staff Answer This silicone can be used with CP soap. The mold will hold approximately 36oz of soap. This mold is two halves that fit together to create a seal for filling. When unmolding you simply pull the two halves apart and away from your soap.